I'm running 10.8.3 Snow Leopard and installed Windows 7 x64 using Bootcamp. Both system are running fine. I couldn't use the bootcamp-partition inside in Parallels and then I read about Tuxera NTFS blocking it. Therefore I uninstalled Tuxera NTFS. 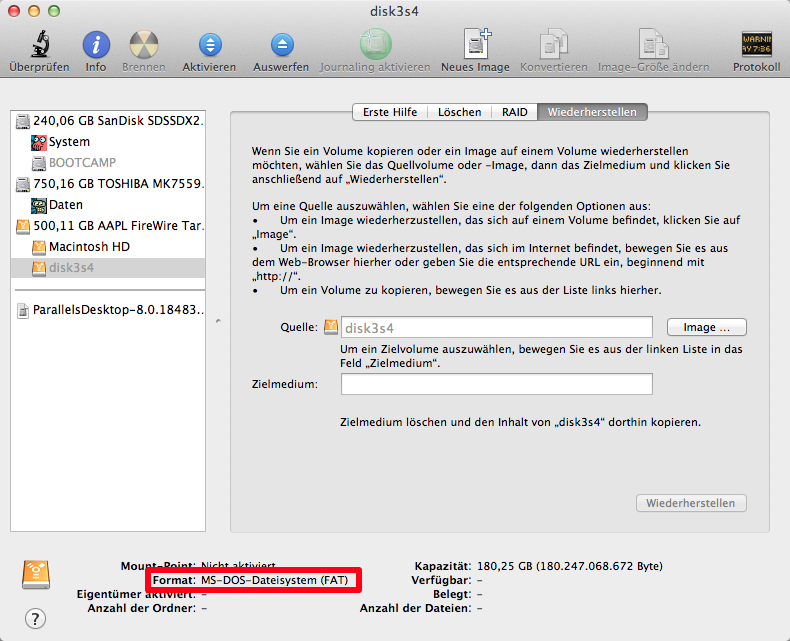 Ever since then the disk utility shows the Bootcamp partition as a FAT-partition (see attached screenshot). Re-installing Tuxera NTFS didn't help either. Error checking and repairing with the disk utility doesn't help. I tried unmounting the whole drive/all partitions via disk utility on another Mac (using FireWire-boot). It didn't work sadly. Does anyone have a clue what else I can do? The Bootcamp-Windows is already set up with my work-environment which took a long time so I don't want to reinstall. Browse other questions tagged macos mountain-lion bootcamp parallels-desktop ntfs .